Tarte Tatin is a dessert that’s very familiar to me. If my mum says she’s making an apple pie, she’s not talking about the traditional American kind…she’s talking about a tarte Tatin. In fact, when my brother was staying with us in Sydney, I made a double-crusted apple pie, and he griped that it wasn’t like our mum’s! But, hey– big chunks of apple that have been cooked down in buttery caramel– who can blame him?? You can use a regular pie crust as your base (or top) if you want, but I just love caramel-soaked puff pastry. There are a couple of things about tatins that can make people a little nervous. First, you have to let the caramel and apples go for awhile…don’t be afraid to let the caramel turn a pretty deep amber. And pack those apples in, because they shrink while they cook. Flipping the Tatin out of the pan might sound a little scary (you, know it bakes upside-down, right? ), but if you wear good oven mitts and flip with confidence, all should fall into place. Whew, two years and over one hundred recipes from Baking: From My Home to Yours…just thinking about that makes me want slip into something elastic-waisted! But seriously, big hugs and lots of thanks go to both Laurie and Dorie. I’m so looking forward to the next year of baking!! For the recipe, see Baking: From My Home to Yours by Dorie Greenspan. It’s also here on NPR, along with an audio link to the radio story. As always, don’t forget to check out the TWD Blogroll! What a delicious dessert to make the anniversary. I’m thinking I may have to get into this TWD action. The dishes all look amazing. Your pastry looks so flaky. YUM-BO! Ciao ! Now I understand why yours is so perfect ! Practice and practice !!! droool 😀 happy anniversary! it looks absolutely delicious. Elastic waisted? YIKES! Your tatin is magnificent. Are those apple halves or apricots? I just made my first tarte tatin a few weeks ago and it turned out great. But yours looks like perfection – and the photo showcases it beautifully. Leave to you, to have the perfect pastry shop tarte… damn you Steph. 😉 It looks absolutely perfect. I am so glad that you have stuck it out with me all this time. Thanks so much for baking along. MUAH! I’d vote for tarte tatin over cake any day. Looks splendid! I so enjoyed making this. I knew that no matter what dessert you chose, it would be perfection. Yep, perfection! I tried and tired to get that rich amber color you described but it jsut wasn’t going to happen for me. I sure loved the flavor though! Your TT is perfect and that is how I wanted mine to look! Oh my! Yours looks so delicious. I could just grab a spoon and scoop up some of that yummy caramel! The color on your tart is so beautiful! But how could your brother not like a double crusted apple pie!? I’ll take it! haha! Gorgeous! I’ll have to try this one, too! Oh my, that is one gorgeous tarte tatin! I’m jealous, I wish I would have been raised on this delicious dessert. Your tarte looks fantastic! I know now that I didn’t let the mixture caramelize long enough–thanks for the tip. 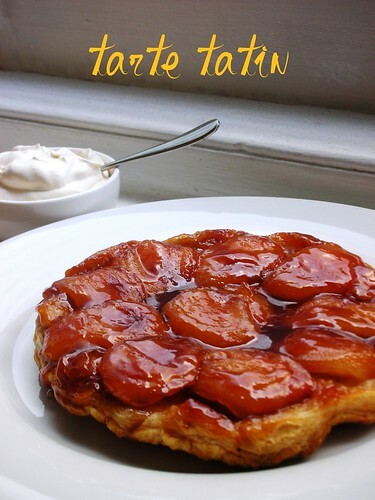 Your tarte tatin looks perfect..even better than the picture in the book….wow! You definitely had to flip with confidence! 🙂 Your tarte turned out beautifully! This was my first Tarte Tatin, and I must say, I may have a difficult time going back to the American version! Yours is gorgeous! I’ve always wanted to make one of these. I think you may just have inspired me! Your tarte looks absolutely gorgeous!! Nice work! This looks fabulous! I’ve never tried this kind of “apple pie” before, but I’ll definitely be making it in the near future. Happy New Year! It looks so rich and luscious! I am glad to have some time again to visit the great TWD blogs and see what everyone’s baking. Yeah, the elastic pants have become more necessary over the last two years… But your tarte looks fabulous! Caramel soaked puff pastry is always a winner. That does look beautiful. This was fun to make and very tasty. How are you? Did you have a wonderful holiday season? I hope you’re doing well, and are ready for another fun and exciting year of baking + blogging in 2010… I’m SO looking forward to making many more yummy cakes together for Cake Slice Bakers, and I’m sure I’ll be learning loads from you along the way! 🙂 You are such an inspiration to me, and I’m really glad I’ve had the opportunity to get to know you these past few months… it’s been a true honor and a pleasure (and my baking has improved thanks to our friendship too)! Your tarte tatin looks absolutely flawless- I’ve actually had that particular fruity dessert on my mind since I simultaneously watched Julia Child make her version on an old episode of “The French Chef,” and opening a X-mas present to find a copy of “Julia’s Kitchen Wisdom,” which contains that very recipe. (Literally those two things happened at the exact same time, it was too funny!) I’ve never made it before, and since I’m slowly overcoming my fear of caramel (check out my latest post if you get a chance!) I think it’s time a tackle it. Any tips, tricks, or advice would be much appreciated, as always! I hope you’re staying warm and cozy despite this shivery cold Northeastern climate! I hope NYC is a tad warmer than Boston which has been simply BITTER. Wrap up in a fluffy blanket with a cup of tea, OR just stand by your oven… I’m sure it’s on, hahaha! Sending you many happy wishes for an amazing year to come! Look forward to talking with you soon! Your tarte tatin looks mouthwateringly delicious! Mine didn’t get as carmelized as I had hoped, but it still tasted great! Happy New year! Such a beautiful tarte Tatin! Your tarte looks amazing Steph, as I would expect. Happy New Year and I look forward to a new year full of your beautiful blog posts. Your tarte is absolutely gorgeous! Makes me want to give it another try as my first attempt wasn’t exactly successful. I’m dying to bake that cake too! That is a stunning dessert! So, so beautiful. Hi there! Gorgeous gorgeous tarte tatin! Hard to find here in Singapore though, veryvery tragic indeed. Maybe I should take to making my own, that is, if I can find or make a gluten free version. I hope you’re keeeping cool in the heat over at Sydney! I used to live in Melbourne I know how crazy it gets! I miss Paddington market, just had a minor i-miss-oz moment! I’ve been meaning to make one of these for a long time…maybe it will happen sooner after seeing your gorgeous tart! Tarte Tartin is a lovely dessert! Only trouble is it never looks as good as it tastes. Your’s however, looks pretty damned good!